"A peasant I was born, a peasant I will die." 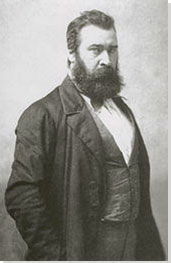 French painter Jean-François Millet, whose humble manner of living stands in stark contrast to the impact his work had on many artists who succeeded him, saw Godliness and virtue in physical labor. 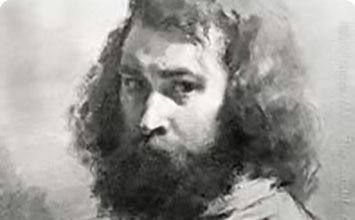 Best known for his paintings of peasants toiling in rural landscapes, and the religious sub-texts that often accompanied them, he turned his back on the academic style of his early artistic education and co-founded the Barbizon school near Fontainbleau in Normandy, France with fellow artist Théodore Rousseau. Millet saw his share of successes and failures with both critics and the public. People were deeply class-conscious amid France's politically volatile climate and perceived with suspicion anyone celebrating the 'nobility' of the peasant-class. Nevertheless, his personal convictions, use of Naturalism, and unromanticized imagery helped lay a foundation for later modern movements in art, and in due course, he became highly-regarded within the art world. Consequently, his practice impacted markedly the methods of many later painters, photographers, and writers who saw Millet as an inspiration, mentor, and friend. Raised in a deeply religious rural farming family, Millet saw the peasant-class as most nobly fulfilling the words of the Old Testament Book of Genesis 3:19, which read: "In the sweat of thy face shalt thou eat bread, till thou return unto the ground; for out of it wast thou taken: for dust thou art, and unto dust shalt thou return." This served as a subtext in most of his paintings throughout his Barbizon years. While most artists of the Barbizon school concentrated on landscapes painted en plein air, Millet preferred to depict the life of ceaseless toil required of the peasant class, a social stratum for which he had great respect. He saw himself as being thoroughly of the peasant-class, stating his discomfort in the drawing rooms of the upper classes, and thus resolved to paint only that which he knew best. Millet depicted his peasants in the same manner earlier movements reserved for more exalted subjects. As a result, his shepherds and farm laborers occupied large spaces on the canvas formerly occupied by historic or Biblical figures, or mythological heroes. Consequently, many of his detractors saw him as an unspoken social critic with a leftist viewpoint, as were fellow Realists Honoré Daumier and Gustave Courbet. It was a time of social unrest in France brought about by the February Revolution of 1848, which did away with the monarchy. This was followed only months later by the bloody, but unsuccessful June Days Uprising in Paris, a rebellion by working-class people who saw their newly elected government becoming increasingly conservative. Millet, however, insisted his interests bore no relation to the politics of the time. Millet's paintings often display traits of his earlier art education during the Romantic period. Previous to the Barbizon school his subjects incorporated mythological and religious imagery, both associated with the French Academy and the 'otherworldly' aspects of Romanticism. While his mature works in Realism were devoted to genre paintings of poor peasants and toiling farmers, there is a subtext rooted in his family's spiritual faith, though it is no longer the main point. This is evident in his iconic paintings The Harvesters Resting (Ruth and Boaz), The Gleaners, and The Angelus. Millet's later works, with their looser, more gestural brushwork, exhibit a freer exchange with non-academic painters such as Impressionists Claude Monet and Andres de Santa Maria, as well as inspiring Georges Seurat, Vincent van Gogh, and Salvador Dalí. Van Gogh, in particular, found a great deal of inspiration in Millet's style and subject matter, being drawn to his images of simplicity in the rural life of farmers. The expressiveness of Millet's brushwork in his late painting Birds' Nesters of 1874 communicates the frenzied movements of the hunters and the explosive panic of the birds so effectively that the viewer is able to experience the intensity themselves. The strong emotion of the painting carries overtones of Romanticism. What puts Birds' Nesters within Realism, however, was the grim reality of the hunt and its necessity so that poor peasants could feed themselves and their families. Millet was the second child of Jean-Louis-Nicolas and Aimee-Henriette-Adelaide Henry Millet, modest peasants who were part of a large extended family in the rural community of Gruchy. His father appreciated music and beauty in nature, as he would show the boy a blade of grass and say, "Look, how beautiful this is." Millet was his grandmother's favorite, and she encouraged a love of reading and a deep spirituality in him. He attended the local school where he studied Latin and read Saint Augustine and Virgil as well as classic French authors. He also learned other aspects of country life, as he was challenged to fight by older boys at school, and worked long days on his family's farm. His somber sensibility was fundamentally shaped by rural work, as he said, "I have never seen anything but fields since I was born, I try to say as best I can what I saw and felt when I was at work." A man with a bag of seeds across his chest strides, long-legged across the extreme foreground of the canvas as he flings his right arm out to scatter handfuls of seed. As he works a flock (properly known as a 'murder') of crows circles behind him on the left, and highlighted in the distance on the right, a man behind a plow drives his team of oxen, preparing the soil for planting. A group of harvesters, dirty and tired from their labors, their tools scattered around them, rest in front of large, golden-hued stacks of grain. On the left, a man presents a woman to the group. Three peasant women gather grains from what's left at the end of a harvest day as the evening shadows gather around them. In the background, a horse-drawn cart full of wheat, haystacks, sheaves of wheat, a man on horseback, a village, and a large crowd of laborers depict the abundance of the harvest. Arguably Millet's best-known work, The Angelus depicts a man and a woman standing in the foreground, with heads bowed, the man holds his hat in his hands, and the woman folds her hands in prayer. The man's pitchfork rests in the earth beside him, and, behind the woman, a small cart contains sacks of harvested potatoes. A basket of potatoes rests on the ground between the couple and potatoes dapple the earth at their feet. The sun is setting, but in the distance where a church steeple and part of a village are visible the sky still shows daylight. In this unusual nocturne, a flock of sheep mills around the sheepfold, some of them already enclosed in the pen, while the shepherd, holding his staff, urges others through the gate. Behind him, his two dogs wait, ready to assist. The shepherd's hut stands out against the night sky, and a huge, three-quarter moon hangs just above the horizon, lighting up the night allowing him to go about his work, unaided. Man with a Hoe depicts a fieldworker as he leans over, clearly exhausted from his labors, his hands upon his hoe. His clothes are rough and dirty, his face careworn, as he stares blankly into the distance. The trench he has been turning runs from the front center edge of the rocky foreground, and curves around behind him, leading the viewer's gaze into the middle distance where his jacket and hat are folded on the ground, and further still, where other laborers burn piles of brush in fields already cleared. Depicting the rugged beauty of the Normandy coast, the work shows the view of the ocean from the Gréville cliffs, their greenish brown slopes and the ocean breaking along the rocky shore lit by the sunlight of a hazy golden sky. Millet's last work, sometimes called Hunting Birds at Night, depicts four people who have gone out to hunt wild pigeons from the flocks that gather in the trees at nightfall. Two figures, one turned toward the viewer and the other facing the trees, use a torch to startle the birds into flight, then run about using cudgels to beat the pigeons out of the air. The one facing the viewer carries a large load of hay upon his back to replenish their torch as it burns. Meanwhile, two additional figures scrabble on the ground, gathering up fistfuls of the fallen birds. The forest provides a dark green backdrop to the macabre scene of brightly illuminated birds flying frantically in all directions.